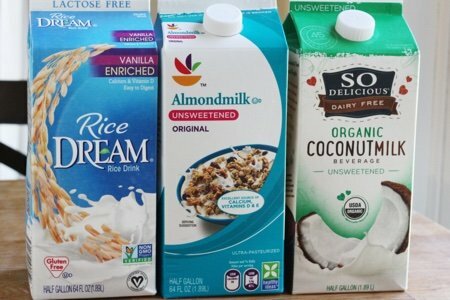 Healthiest Milk Alternative: So Many Choices! The healthiest milk alternative is not an easy thing to determine. First, we have to define the word “milk”. I know that when I was growing up, I put one kind of milk on my cereal, cow’s milk. Milk, by definition, is a white liquid produced by the mammary glands of mammals. So what all those cartons up in my photo? Are they milk? I would say no. Rice dream is rice juice. Almond milk is almond juice. Coconut milk is hmmmm – coconut liquid? Are these drinks any different than orange juice? I took a hard look at orange juice in my post Is Orange Juice Healthy?. The short answer is no. For people who are lactose intolerant, vegan, or think that it is weird to drink cow’s milk, these are a great alternative to cow’s milk. But which are the healthiest choices? These all have a healthy halo because they are derived from plants products but just like kombucha – is the halo justified? I reviewed kombucha in June in my post What is Kombucha?. Before we start looking at these - remember to buy the ones that are unsweetened or have no added sugar. If sugar is added – then you are just drinking the equivalent of chocolate milk which I do not recommend as a healthy drink (but is great as a treat). There is 11 grams of sugar, 9 grams of protein, and they add vitamin D.
You can see that there is 12 grams of sugar, 1 gram of protein, and they add calcium, vitamin A, vitamin D, and vitamin B12. You can’t really expect a liquid derived entirely of rice (mostly carbohydrate) to be packed with protein like cow’s milk. This is not equivalent to cow’s milk and I wouldn’t choose it as an alternative. Coconut milk has 0 grams of sugar, 0 grams of protein, and added calcium etc. It has 4.5 grams of fat and only 45 calories for 8 ounces so if you are looking for more fat in your diet – this could be a good choice but it is not a replacement for cow’s milk. Almond milk has 0 grams of sugar, 1 gram of protein, and the added calcium and vitamins. It has 2.5 grams of fat and 30 calories per serving. Almond milk is the best choice of these three as a cow’s milk replacement but you need to drink more of it to get a protein boost. I happen to like almond milk as a replacement for cow’s milk in my coffee and I always use it in my banana, peanut butter smoothies. The very best milk alternative is soy milk. It has 6 grams of sugar, 8 grams of protein and calcium and vitamins added. This is as close as you are going to get to cow’s milk and if you like it – I would use it all the time instead of cow’s milk. One very nice thing about soy milk is that it doesn’t go bad as quickly as cow’s milk. I get a good 10 days out of a container of soy milk after I open it. Whether or not you choose to drink cow’s milk, it is good to know that all of these milk alternatives are not the same nutritionally. Which of these milk alternatives do you drink? Please share. I've heard that soy can affect the body like estrogen. Do you know if that's true, Snack Girl? Any thoughts on Flax or Protein Nutmilk? Above post asks about soy as an estrogen. I believe that is true as well. Those predisposed to breast cancer (genetic or has been in the family) my want to avoid phytoestrogens. While Asians are big consumers of soy they do not eat it the same way Americans do nor in the same quantities. Also historically soy has not been genetically modified and it's very hard to find non GMO soy in the USA now. I would caution overuse (ie: daily) of soy and soy products. I do love edamame as a snack a couple times a week and therefore avoid soy as a beverage. The other issue with non-dairy milks are the other ingredients added to them. Sugar isn't the only thing added and some of the other ingredients are questionable. 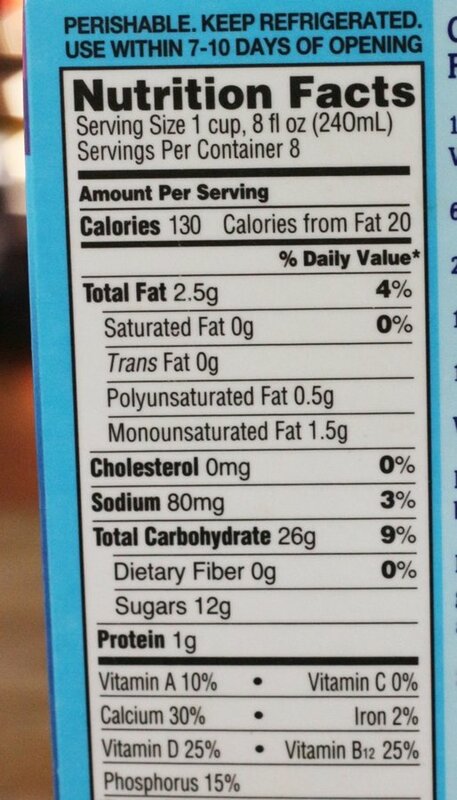 Sometimes it isn't just about the nutrition facts and reading the ingredient list is just as important. Check out oat milk. It is sweet without any added sugar and has both protein and fiber. I cannot drink soy milk because I have thyroid issues (Hashimoto's), so I drink unsweetened vanilla almond milk. My doctor advised about the soy milk and approves my milk choice. Personally I will only drink Almond Breeze. My son says Pea protein milk (Ripple)is the closest he has found to dairy milk in texture and taste - and it has a decent amount of protein. I plan to try it soon and will let you know what I think! My daughter gives my grandson Hemp milk and he loves it. Has never had milk. Soy gives people with lupus trouble, so I have to stay away from that. Please be careful with over consumption of soy products. I had uterine cancer three years ago and one of the reconmendations of the oncologist was to eliminate soy products. She said the jury is still out on soy but she did say that some studies have shown that it can affect estrogen production which in turn can increase the likelihood of developing some forms of cancer. What are your thoughts on Fairlife? It's cow's milk, but they say it's filtered less. If you read the nutritional facts on the bottle, it has less sugar and more protein. So many people have told me that giving up cow's milk have helped them lose weight because it has so much sugar... but I just don't think I can do that! My non-dairy milk choices depend on the way I'm using them. I usually drink almond or cashew, use soy to make yogurt and use all of them, along with coconut for baking and cooking. All are unsweetened. I always buy Silk or Califia unsweetened almond milk. Neither contain carrageenan, which is an inflammatory. 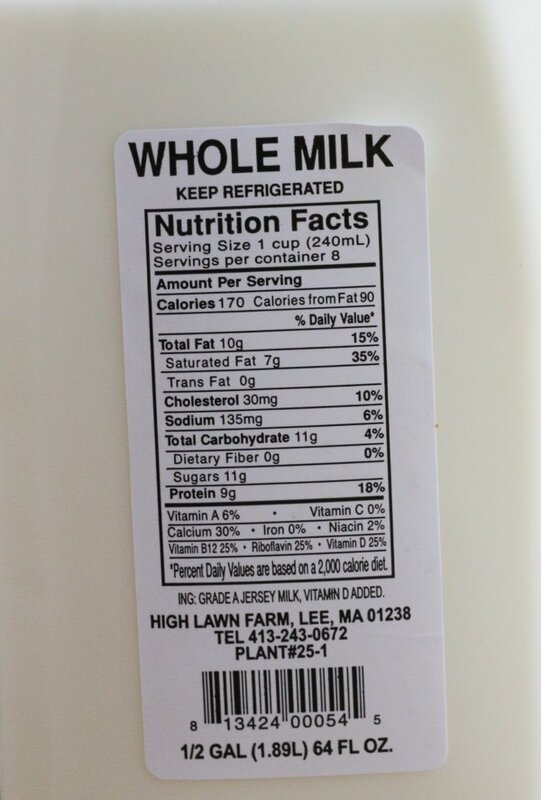 When purchasing any non-dairy "milk" be sure to read the label and look for the fewest ingredients. Most store brands and Blue Diamond do not have the most healthiest ingredients, both contain carrageenan. Dairy is very inflammatory, so you are better off using a nut milk when at all possible. The less fat in the milk (skim, 1 or 2%) increases the sugar content. This is because after the fat is removed, it leaves behind the lactose, which is sugar. If you are going to use dairy milk, purchase whole organic milk from grass-fed cows. That way you will get less sugar and more Omega 3. I agree with the previous posts about soy not being healthy. In the United States it is too over processed and can effect risk for cancer in those with a family history. I have hypothyroidism (very common among women) and I too have been discouraged by my doctor from regularly eating or drinking soy products. She feels strongly that these products' safety has not been thoroughly tested or proven.